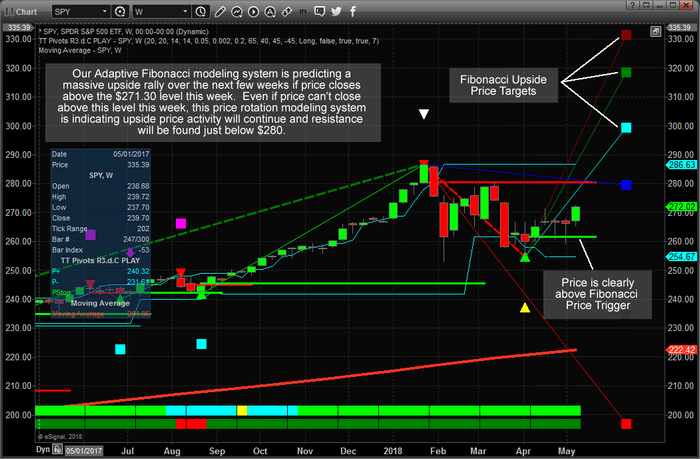 Our Next Stock Market Dow Fibonacci Price Targets – Get Ready! When you consider the fact that we were making and publicly publishing these predictions about what price would do many weeks in advance and somewhat accurately predicting many of these price swings, one has to ask “just how powerful are these adaptive price modeling systems and what advantage can that provide me?”. Today, we are going to share some Weekly Adaptive Fibonacci price modeling that clearly illustrates we are in for a very exciting ride in the US markets. This first chart of the SPY is showing us that the current price level is well above the Bullish Fibonacci Trigger level which indicates that current trend is to the upside. It also points to resistance being just below the $280 level. The current price level has already breached a previous price peak and if price advances further by the end of this week, we will consider this a confirmation of a new rotational price high which will further strengthen our opinion that price will push dramatically higher. Please note the upside Fibonacci price targets because they indicate we could be in for a very dramatic and extended price rally from current levels. The first upside price target level is @ $299.45, the next higher level is @ $318.50 and this furthest target level is @ $331.40. These represent a +10% to +21% upside potential in the SPY. You better believe you won’t want to miss this move and you better be prepared to know how to trade it because we believe volatility is here to stay and nothing goes straight up. We currently have 5 open winning positions with three of them up over 10% already! 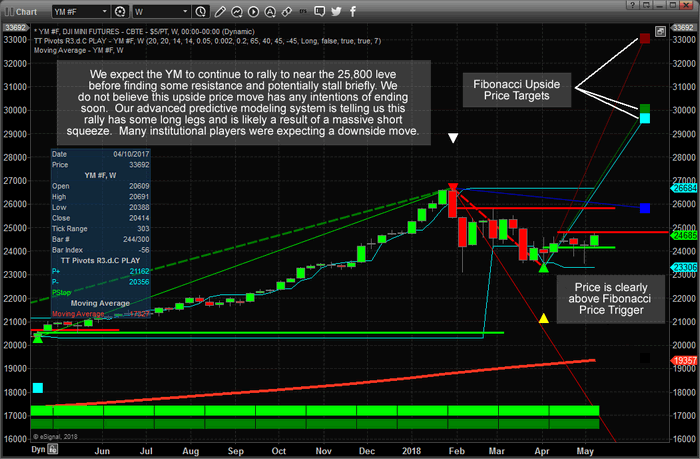 Taking that same analysis model and applying it to the YM (Dow Futures) Weekly chart presents an even more dramatic picture of the future price potential. The charts are fairly similar in structure, although where the SPY has already breached the most recent price peak levels, the YM has yet to accomplish this. This would be one thing we are still waiting for in terms of confirmation of the upside potential in the YM. Yet, taking a look at the other data from this advance price modeling system, we have a very clear indication that a major price top has recently formed near the early February price peak. We can also see an intermediate price bottom has formed near April 2 – resulting in a new upside price rotation. Fibonacci price theory indicates that “price MUST attempt to establish a new price high or low at all times”. Therefore, the failure of the SPY and YM to break below the February 2, 2018 price lows indicates the markets were attempting to hammer our a bottom formation. The rotation of lower high price peaks while the February 2 ultimate low held was a very clear indication that we just needed to wait for the price rotation to establish a new high before we could call a formal end to this downside price swing. That time is almost upon us as recent price rotation has established a new “higher” rotational price low (on April 30th) and the SPY & NQ have already breached these levels to the upside. Now, we are just waiting for the other US majors (ES & YM) to accomplish this price trigger and we will have confirmation that “price is telling us it wants to rocket higher. Look at the upside range in the YM – incredible. The first Fibonacci target level is @ 29,683, the second one is @ 30,055 and the highest one is @ 33,058. Let me put that into perspective for you, these represent an upside potential of between +21% to +35% in the YM. We are certain you are asking yourself “how in the world can this be possible? Everyone has been saying the markets are going to rollover and tank? ?” We are simply reporting what our modeling systems are telling us is the most likely outcome and we want to urge you to understand these predictive price targets could be months out into the future. Additionally, new price rotation will create revised price targets as one of the key functions of Fibonacci price theory is that “price will always tell you where it wants to go” as long as you understand how to apply proper Fibonacci price theory. The final component to all of this research is to ask yourself WHY the US markets would have the potential for +10% to +20% or more upside price moves if everyone thinks the US markets are going to rollover and start trending down? Could it be that so many people have concluded the wrong analysis? Could it be that something dramatic is about to unfold in the global markets that would make the US markets appear to be the “best and safest asset on the planet”? Could it be that we are setting up for a massive leg higher and nearly everyone on the planet has failed to see the upside potential? Our members have access to much greater insight and analysis than we can share here publically. We reserve our most advanced price modeling systems, predictive analysis and research for our exclusive membership levels. We are warning you that a massive upside swing is about to setup and you’ll want to be prepared for it because this could be a true “once every ten years” type of move. We also urge you to consider joining www.TheTechnicalTraders.com as a member to receive all of our detailed updates, daily videos, trading signals and more. If you don’t believe we can assist you in your future with our research, analysis and other features and benefits, you can cancel your subscription and move onto something else. Either way, we urge you to be prepared for this next move higher and take a few minutes to read over our most recent public research posts. Visit www.TheTechnicalTraders.com to see how we can help you achieve greater success.